Everyone feels overwhelmed from time to time. It’s what we do when we’re feeling overwhelmed that makes all the difference. It doesn’t have to be a complicated or drawn out process to manage stress and overcome anxiety. There are simple things you can do in the moment and throughout the day that can provide the relief you need. 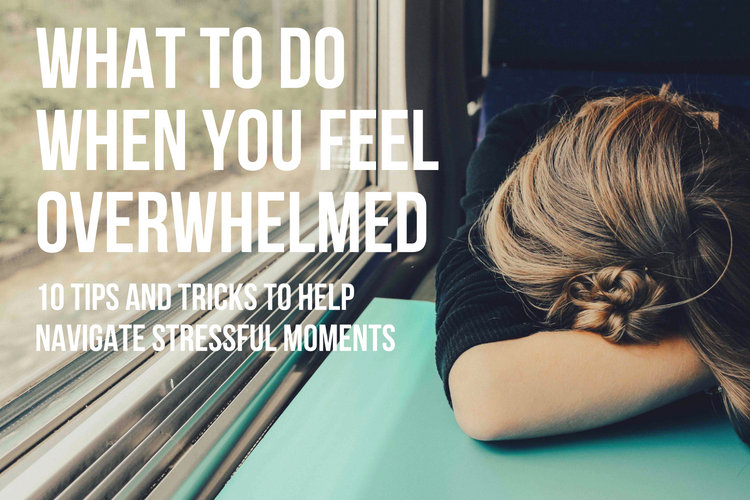 Here are 10 tips and tricks to help you when you’re feeling overwhelmed. Your body will let you know what it needs. More often than not what your body needs is time to recover. One day is 24 hours long. Most adults need 7-9 hours of uninterrupted sleep. So, when we do not get enough sleep, it’s as though our bodies store all the stress and anxiety of the day. When we feel overwhelmed, we put our bodies in “fight or flight mode.” This then makes it harder to fall asleep and stay asleep. But if you keep a schedule where you go to bed at a certain time (no matter what), you will be able to deal with stress and anxiety much better than before. Same principle here: your body will tell you what it needs. The food you eat can be a window into how you feel. The goal is about balance. So if you’re not eating enough or overeating, that is a sign of a problem. Pay attention to what you eat, how you eat, and when you eat. When you eat better, you feel better. And when you feel better, you do better. When you feel overwhelmed, oftentimes the best thing to do is get your body moving. Sometimes you just need to take a walk to clear your head. Other times might require something vigorous. If you make the space to exercise regularly, things get easier. Make it sustainable and realistic. But most of all, make the investment in you. It just takes a minute. Whenever you feel overwhelmed, take a minute and breathe. If you stop and breathe, and give yourself some precious space, then your brain can catch up to the moment and process information in a way that’s helpful. So, here’s the exercise: Take a slow deep breath through your nose for 5 seconds, then hold your breath for 4 seconds, and breathe it out through your mouth for 6 seconds. Think, “smell the rose, and blow out the candle.” Do this ten times, and your nervous system activity will settle down. 5. Be mindful. Be thankful. Stress management is really about perspective. When we lose direction and feel like everything is coming at us all at once, we feel trapped. This is when we shut down. The truth is so much of life is going well if we just take the time to appreciate it. It may feel impossible in the moment, but try to take a minute to recall something that made you feel grateful. You may want to try journaling those moments down. So when you begin to feel overwhelmed, you have the moments right in front you. It doesn’t have to be profound. “I’m thankful for the flowers blooming.” “My kids ate dinner without throwing a fit.” It just needs to be a way for you to change your perspective. Take a nap. Schedule a personal day. Find a space in the day where you can disconnect your thoughts from whatever causes you to feel overwhelmed. Sometimes we think we’ll feel better after we work through everything. We delay joy and satisfaction because we think we can’t feel good until we solve the problem. The truth is we can change how we feel by the choices we make. When the task list doesn’t seem to move, get up and take a break. Choose to feel happy, clear your head, and then get back to work. When you feel overwhelmed, take a look at the space around you. Chaos and disorganization prove the existence of stress. Not only do they prove stress, they feed the stress. The messier the house or the workspace, the more stressed out you’ll be. If you just take some time to clean, you’ll feel so much better. Loud noises cause automatic stress responses. Moreover, when noise continues for extended times, your body has a hard time alleviating the heightened state of stress. While listening to music can be relaxing, too much music can do harm. The same goes for conversations or watching TV nonstop. Our bodies need time to recover. So having things quiet for a long stretch of time can be exactly what you need. While it may take some time to get comfortable with the quiet, it is worth it. If work or school just feel relentless, sometimes you need to feel successful somewhere else. Is there a passion project you want to do? Have you wanted to see how good of beer you can brew, or if you can grow everything to make salsa? Feeling overwhelmed can have to do with thinking that there is “no end in sight.” So, if you start a small project you can finish, you get to feel satisfied and rewarded. This also helps put things into perspective. Because now you get to see that there is so much more to life and who you are than a tough job or finals. Turns out you’re pretty good at pottery or you can make your own tofu. You are more than your job. If you feel alone in the stress, find someone. If the work seems daunting, you may need to ask your supervisor for support, or you need your team to pick up more of the workload. And if you haven’t talked to anyone about all you are going through, invite someone you can trust into the problem. We have an innate need to live in relationships. So you don’t have to do it all by yourself. In fact, you can’t do it by yourself. We need each other, and part of that need is that your friends and family need you to ask them for help. Our staff is ready to provide support and tools to help you and your family navigate stress and anxiety. Contact us today to schedule an appointment for you or your child.